Vessel (Svanen) for installation of transition pieces and turbines: Ballast Nedam N.V. The wind farm powers120,000 homes in the Tendring district and Colchester. A shore-side view of the Gunfleet Sands wind farm. An offshore substation installed on site collects the electricity from the turbines. An aerial view of the Gunfleet Sands wind farm. Turbines were installed on the top of monopile foundations. Construction activity at the Gunfleet Sands windpower facility was undertaken by number of cranes, tugs, barges and fast powerboats. 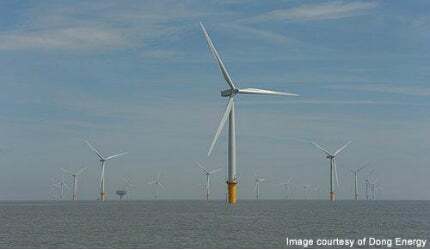 The Gunfleet Sands offshore wind farm is located approximately 7km south-east of Clacton-on-Sea in Essex, UK. The wind farm has a total power output capacity of 172MW. It supplies electricity to 125,000 homes, which is approximately 90% of households in the Tendring district and Colchester. It is owned by DONG Energy (50.1%) and Marubeni Corporation (49.9%). The wind farm was officially inaugurated in June 2010. It was commissioned in two phases, Gunfleet Sands 1 and 2, with 30 and 18 turbines respectively. It transmitted its first green power to shore in August 2009 and achieved full production during the spring of 2010. The project stemmed from The Crown Estate’s initiative to increase the production of wind energy in UK. The Estate devised three phases of development to achieve its aim. Round 1, was announced in 2000 and Round 2 was announced in 2003. Tenders were invited by companies interested to take offshore sites on lease and develop wind farms. Gunfleet Sands was tendered and approved in Round 2. The project has contributed domestic UK targets by decreasing CO2 emissions by 20% by 2010. Compared with coal-fired power plants, Gunfleet Sands 2 (Phase 2) is expected to reduce carbon dioxide emissions by approximately 480,000t. "Gunfleet Sands was tendered and approved in Round 2." The anemometry mast installed in 2002 confirmed good wind speeds at the site. Gunfleet Sands 1 and offshore substation, array cabling and export cable received approvals during 2003-2004. The Crown Estate granted the construction of the first of 15 Round 2 sites in December 2003. Phase one of the development was carried out in a total area of 10km², while phase two was carried out in 7.5km² area. In August 2010, Dong Energy was awarded a lease site next to the phase one development area to initiate the Gunfleet Sands 3 demonstration project. The project includes the construction of two Siemens 6MW next-generation offshore wind turbines. In April 2012, Dong Energy received authorisation to begin construction of the project. The new turbines are expected to be installed by the end of 2012. DONG Energy began the wind farm construction in spring 2008. All 48 turbines were supplied by Siemens Wind Power. Construction was due to be completed in Autumn 2009, but was delayed due to the liquidation of cable installation contractor Oceanteam. The first Round 2 turbine at Gunfleet Sands was installed in April 2009. Round 2 has the potential to supply 7.2GW of clean electricity to the UK power market and follows Round 1, which provides 1.5GW capacity. Gravel and rocks were used for scour protection. Directional drilling was carried out for the installation of onshore cables. Three dedicated power cables and a small communications cable were laid in a trefoil arrangement using a combination of open trenching and duct installation. Numerous tugs, barges and fast powerboats were used for the transportation of materials and staff. The turbines were supported by monopole foundations of 5m diameter, overall lengths of up to 75m and a seabed penetration depth of up to 50m. The monopoles were laid using the offshore vessel Excalibur owned by Fugro Seacore. Offshore vessel Sea Worker owned by A2SEA was employed to erect the turbines. Its maximum height above mean high water springs (MHWS) is 129m from tip to sea level. "The Gunfleet Sands wind farm is operated and maintained from the town of Brightlingsea by DONG Energy." The turbines are installed in accordance with the guidelines of the Royal Yachting Association with a minimum of 22m from lowest blade tip to sea level at MHWS. They are positioned with a spacing of 435m×890m. Each of the 48 turbines generates electricity at a voltage of 33kV. The offshore substation collects the electricity from all the wind turbines and paces the voltage up to 132kV for the local grid. Underwater power cables connect the turbines to the shore at Holland on Sea via an offshore sub station located at Cooks Green. The wind farm is operated and maintained from the town of Brightlingsea by DONG Energy in cooperation with the turbine supplier Siemens. An operation base was built by DONG Energy at Brightlingsea. The UK became the world leader in offshore wind farms when it surpassed Denmark in 2008. Offshore wind energy generation in UK reached the 1GW mark in April 2010. The UK’s wind sector is expected to record the highest growth in renewable electricity market in future. The growth is projected at the achievable targets of 25GW of offshore wind energy by 2020 provided that planning and grid restrictions are freed. The Thanet Offshore Wind Farm is located 11km from the coast of Thanet, in Kent, UK. Construction on London Array, which will be the world’s largest offshore wind farm, began in July 2009.